The Proof American Gold Eagle is the official collector’s version of the nation’s bullion coin. Available with patriotic imagery on both sides and struck by the United States Mint, these coins are highly anticipated each year by collectors. 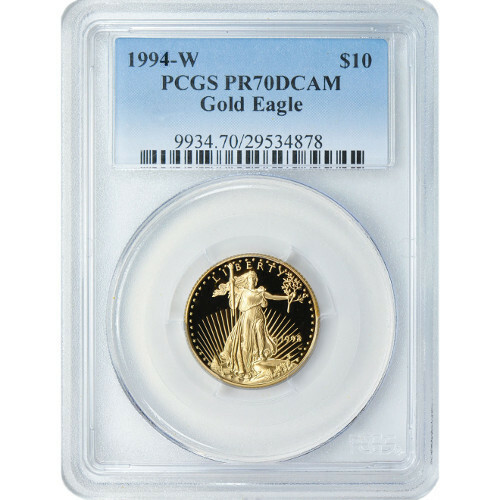 The 1994-W ¼ oz Proof American Gold Eagle is available online for purchase today from Silver.com. Just 353 coins earned this certification and designation! 9th annual release of the Proof American Gold Eagle coin. Contains ¼ oz of 22-karat gold. Issued a face value of $10 (USD) by the United States government. Bears a grade of PR70 from the Professional Coin Grading Service. Available with a DCAM finish. Features the “W” mint mark of the West Point Mint. American Gold Eagle coins had been produced at two different mints in the US Mint system prior to the 1994 production year. All 1 oz Proof American Gold Eagle coins had been produced at the West Point Mint since 1986, but the Philadelphia Mint handled production of the fractional-weight coins beginning in 1987 and 1988. From this point forward, all Proof American Gold Eagle coins would be produced by the West Point Mint, as well as all bullion coins in the program. Mintage in 1994 was up just slightly from 1993, rising less than 2,000 in total. This is largely attributed to the approach of the US Mint’s 10th anniversary celebration the following year in 1995. On the obverse of all coins is the image of Lady Liberty from Augustus Saint-Gaudens. Created in 1907, it originally appeared on the $20 Gold Double Eagle coin from 1907 to 1933. The reverse features the family of nesting bald eagles created in 1986 by Miley Busiek, and is an exclusive design of the American Gold Eagle coin series. Each of these coins is a perfect specimen according to the PCGS. Coins with a PR70 grade have full, original mint luster and feature no detracting flaws of any kind. Additionally, these coins have a DCAM finish that includes strong, frosted designs and a deeply-mirrored, clear background field. If you have any questions about Proof American Gold Eagle coins, we encourage you to reach out to Silver.com. Our associates are available on the phone at 800-276-6508. We’re also available online using our live chat and email features.